The CAHME/Dawn Gideon Foundation Scholarship is named in memory of Dawn Gideon, who devoted her career to helping healthcare organizations succeed and who herself graduated from a CAHME-accredited MHA program at the University of Pittsburgh. The Scholarship is targeted to supporting women pursuing advanced education in healthcare management and who have demonstrated a commitment to communities in need. Since Kaitlyn Chana was knee high she wanted to be a storyteller; she strives for purpose, brings truth, and helps others. It’s the crux of why Kaitlyn founded a nonprofit charitable organization called Reel Stories. Real People., Inc., in hopes, to tell positive stories of exceptional work being done in communities through video. Kaitlyn is working to obtain her master’s degree in Health Administration at the University of North Florida. She’s working on incorporating narrative storytelling in the health care industry to improve patient care. exceptional work being done in communities through video. Kaitlyn is working to obtain her master’s degree in Health Administration at the University of North Florida. She’s working on incorporating narrative storytelling in the health care industry to improve patient care. Her passion for storytelling cultivated in her early years after spending time with children with life-threatening illnesses in hospitals through her previous nonprofit organization, Love Letters: Random Cards of Kindness, Inc. As a teenager, she traveled the country speaking about volunteerism as a Congressional Gold Medalist, 2010 Winter Olympic Torchbearer and as a spokesperson for the clothing store, Aeropostale. disorders. She lives by the motto, “It only takes one person to move a mountain and then others will follow,” and she hopes this quote inspires others to do the unimaginable. The 2018 winner of the CAHME/Dawn Gideon Foundation Scholarship is Callie Parks, a student at the University of Arkansas for Medical Sciences, Master of Health Administration Program. Callie earned a Bachelor of Science in biology from the University of Central Arkansas, where she served as President and Treasurer of Alpha Sigma Alpha Sorority, and represented her classmates on the Student Government Association. She was also recognized as a President’s Leadership Fellow, Outstanding Greek Woman, and “Who’s Who” among students in American Universities & Colleges. Prior to beginning graduate school, Callie worked as a certified nursing assistant at a skilled nursing facility and medical assistant at a federally qualified health center. These experiences, coupled with a family member’s hospital stay, led her to pursue a Master of Health Administration. During her time in the Master’s program at UAMS, Callie has actively pursued opportunities to complement her academic training and skills. She started working as a graduate assistant at the UAMS Myeloma Institute in her first year, and subsequently started her role as a Baptist Health Administrative Intern. Callie also serves as the Vice President on the MHA Student Association. Under her leadership, the organization has focused on increasing the integration between students and healthcare leaders by organizing professional development sessions and increasing the visibility of the MHA Program locally and nationally. Following graduation in May 2019, she plans to pursue an administrative fellowship. Callie considers receiving the CAHME/Dawn Gideon Foundation Scholarship an honor as Dawn’s commitment to the field has paved the way for aspiring female healthcare leaders like herself. One of her personal goals is to create a professional group that fosters close partnerships between women who work in healthcare in the Central Arkansas area. Callie’s nomination noted her intellectual and academic excellence, leadership and communication skills, and commitment to innovation and service to others. The Commission on Accreditation of Healthcare Management Education (CAHME) has named Samantha Clark as the first recipient of the CAHME/Dawn Gideon Foundation Scholarship. The awarded scholarship includes a $2,000 scholarship. Samantha is a second-year student in the University of Washington Masters in Health Administration program. 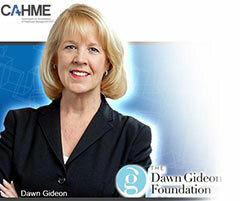 The Scholarship recognizes graduate healthcare management students who embody the spirit and attitude of Dawn Gideon. Samantha entered UW’s program after working several years as a healthcare social worker and case manager. As a first-year graduate student, she was part of the UW team that achieved second place in the highly competitive University of Alabama at Birmingham Health Administration Case Competition. This past summer Samantha interned with the Northwest Physicians Network in Puget Sound, and is now, in addition to her classwork, consulting with the NW Providence Medical Group in its Quality High Reliability department. Click Here to learn about other CAHME Partnered Scholarships.